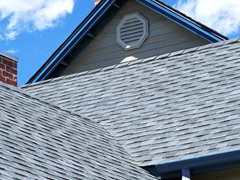 Although shingle roofing is synonymous with residential roofing, many of J. Wilhelm's commercial clients select it for their roofing system for its many qualities and benefits. Ideal for steep slope systems, shingle roofing is a cost effective alternative to metal and tile roofing. The initial installation costs are moderate because shingles are generally easy to size and attach to the roof deck, and serve as a flexible complement to most roofing systems including single-ply and built-up roofing. Over the life of the roofing investment, shingles will stand-up to all weather conditions - requiring minimal maintenance. Depending on the manufacturing grade of the shingles, the average life span can range from 25-40 years.